Plate 1 of 'Hindoo Excavations in the Mountain of Ellora near Aurangabad,' engraved by Thomas Daniell after the drawings of his deceased friend James Wales, which Daniell regarded as the sixth set of his 'Oriental Scenery.' This and next two plates form a continuous panorama of the spectacular site of Ellora, famous for its series of cave temples excavated into the rocky façade of a cliff of basalt. The Buddhist excavations are in the southern part of the site (plate 3); the Hindu caves are situated in the middle (plates 1- 2) and the Jain excavations are at the northern extremity (invisible here). The works were done under the patronage of the Kalachuri, the Chalukya and the Rashtrakuta dynasties between the 6th and the 9th Centuries. 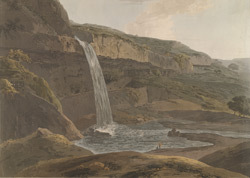 The dramatic scenery of the Ellora had many of the "picturesque" and "sublime" characteristics that were in vogue in the eighteenth century British landscape painting.